Please check the pages "2015-2017 construction" for new progress reports. May 2015 update: The plans have been approved for the construction of the shell of the building. It will be arriving on Wednesday, June 3rd. to start construction! Please continued to support us, so we can strive to finish the inside of the building and then begin to take in domestic animals and save lives by adoption! Thank you. January 2014 update: GREAT NEWS! WE ARE ON OUR WAY TO STARTING CONSTRUCTION! The CCAPL Board of Directors called a special meeting after the regular meeting Thursday, May 1st, to vote on moving forward with Morton's Buildings, Inc.
By a unanimous vote of all seven Board of Directors present, the motion was made by Vice-President Lorna Whaley and seconded by Barbara Manning to send to Morton Builders, Inc. the cost of Step 2 for $22,500.00 down payment to authorized them to finalize the Architectural, Structural, Electrical, Plumbing and HV/AC designs and obtaining the permits, based on the Conceptual Plan completed under Step 1 as noted and approved by the CCAPL Board of Directors. Shawn Simmerman, the Morton Building, Inc. representative, was notified Thursday evening regarding the vote to move forward. Shawn advised the Board of Directors at the April 24th, director's meeting, it will take approximately 4-6 months before actual start-up construction could take place. That is okay. we have worked so hard in the last seven years and almost four months to get to this stage. The Carroll County Animal Protection League has received the second monetary grant from the The John H. & Evelyn L. Ashton Preservation Association, Inc.of Carrollton, Ohio. Their commitment to us is $4,000.00 each year from 2013 to 2015. We thank the John H. & Evelyn L. Ashton Preservation Association, Inc. for their generosity and support to us. This monetary donation grant will be used in the no-kill animal shelter construction. March, 2013- The CCAPL's President has been informed by the President of the Carroll County Humane Society regarding the $50,000.00 restricted endowment gift given to the CCAPL July 15, 2008. The Carroll County Humane Society stipulated in the agreement they would give us five years to build the animal shelter. If it is not built by July 15th, 2013, we have to return the restricted endowment gift of $50,000.00, plus interest earned in the separate savings account. They will not allow an extension. We returned the $50,000.00 plus interest on Aug. 4, 2014. We will continue in our efforts to build a greatly needed animal shelter for Carroll County! The glass is half full! Cost to build the animal shelter structure, sewer plant, fencing, well drilling, and the necessary inside needs: $500,000.00. We have raised over $188,000.00 so far towards the construction. If one million people gave one dollar ($1.00), we could build our shelter and supply the needs within to get it running and save lives of so many wonderful companion animals! January 2013: The animal shelter floor plans have been approved and we have them from Morton Buildings, Inc. at a cost of $5,000.00. We will now try to find a contractor to do the structural and mechanical part of the plans and continue to raise the funding to build our no-kill animal shelter and the needs within the shelter to operate. Thanks for your patience! November 1st, 2012: The CCAPL's Board of Directors and the Animal Shelter Construction Committee has recieved the revised animal shelter floor plans from Morton Buildings, Inc. Once the Board and the committee meet to review these plans and the Board approves them, they will be sent back to Morton Buildings, Inc. to send to the State of Ohio. Updates to follow. Thank you. October 24th, 2012: The CCAPL's Board of Directors voted unanimously to send the revised floor plans to Morton Buildings, Inc. for their architect to finalized the plans. Once finished, they will be sent to the CCAPL's Board of Directors for final approval before being submitted to the State of Ohio by Morton Buildings, Inc. This process will take approximately 3-4 weeks before being sent to the state of Ohio, so we ask for your continued patience. Thank you. October 23, 2012: The CCAPL's animal shelter construction committee met on Thursday, October 4, 2012 to go over the revised animal shelter plans done by member Lorna Whaley. A couple changes needed done on hallway widths for regulations. These new revised plans will be presented to the CCAPL's Board of Directors for approval on October 24, 2012, then, if approved, sent to Morton Builders, Inc. to draft changes made by their architect, then sent back to us. Once approved, they will then be sent to the State of Ohio. It is a slow process so we ask your continued patience with us. This is a monumental step in our progress and we want to make sure the plans not only fit our needs, but are the right ones for our animal shelter. More updates to follow as we progress in our efforts to the beginning stage of starting construction. September 2012: The Board of Directors and the animal shelter construction committee met on Thursday evening on Sept. 6th. 2012. We have reviewed the Plan A and Plan B floor plans for the animal shelter submitted by Morton. Some changes have been made and we will be consulting Morton Buildings, Inc. on these changes. When we are all on board with the changes, Morton will send them to the State of Ohio for approval. Please be patient with us as this is a learning process for us and also we want to get it right before submitting our shelter plans to the state. More updates to follow. 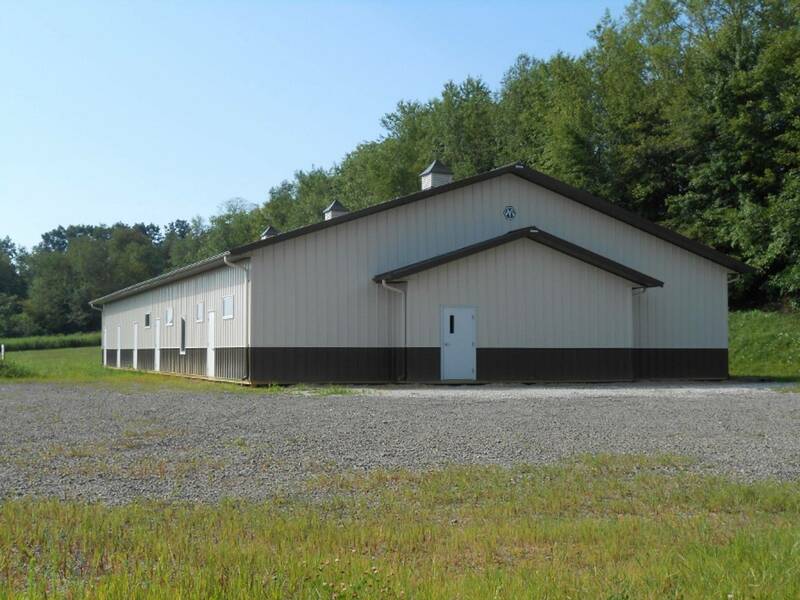 July 5, 2012: The CCAPL's Board of Directors voted unanimously to pay Morton Buildings, Inc. (stainless steel construction company) to do the new animal shelter plans at a cost of $5,000.00. These plans will consist of the structural and mechanical drawings which will be sent to the State of Ohio for approval. Approximate time is two months. Further details will be posted as soon as possible. April 2012: The animal shelter construction committee is currently researching other shelters for designs for what will work best for us with the animal shelter site on our land. Check back for more details. 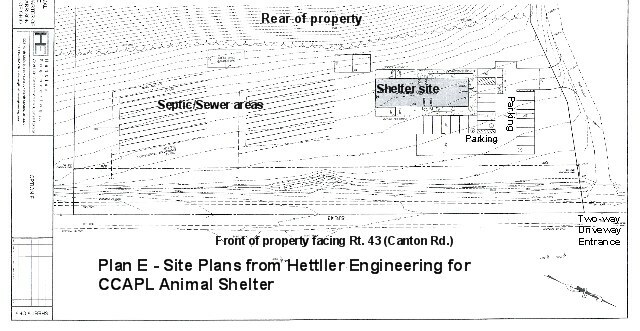 Update: At the March 2012 regular meeting, an "animal shelter construction" committee was formed. The committee is researching options for construction of the animal shelter using galvanized steel structure in lieu of cement block to save on costs. More details will follow. Once the animal shelter plans are done, they will be submitted to the state of Ohio for approval and further construction will occur as funding is raised. 2011: The preliminary animal shelter construction costs is estimated at $300,000.00. (Note: Increased in 2013 to $500,000.00 due to increase in new animal shelter plans). Grant funding and any available means of funding will be pursued for construction, employee wages, maintenance, and other factors needed to run and operate this facility which will reduce the costs we will incure. This animal shelter will be an asset to the community as well. It is all about saving lives. Although there is an euthanasia area, no animal will be euthanized for needed space--only for the humane relief of that animal's suffering by veterinarian recommendation. We will not let an animal suffer needlessly. Here is Plan E proposed Site Plans, voted on by members present at the November 3rd, 2009 CCAPL meeting. Drawn by Mike Hettler, Hettler Engineering, North Canton, Ohio.